Most of you might never have heard of Ferroelectric storage, so here’s a short introduction. Scientists believe harnessing a ferroelectric medium can produce a new means for data storage for computing, i.e. hard disk drives and flash memory would be rendered obsolete. Alas, the potential of ferroelectric storage is still being tested in Japan’s Tohoku University. That said, the bit of news that we’re glad to report is Kenkou Tanaka and Yasuo Cho have reported to the American Institute of Physics that they’ve successfully achieved 4 trillion bits of data density per square inch. How? 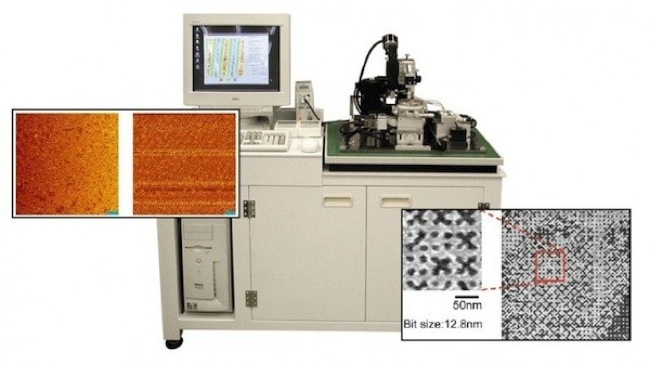 Allow us to elaborate: A Scanning Nonlinear Dielectric Microscope was used as a storage apparatus and with the help of a pulse generator the scientists were able to send pulses to a Lithium Tantalate (aka ferroelectric) medium. The resulting 4 trillion bits per square inch were encouraging but further tests are still in progress. The Tanako-Cho tandem want the right pulse amplitude to transmit the massive amounts of data necessary for optimum ferroelectric storage. In a nutshell, it doesn’t work yet and our hard disks won’t become extinct for the time being. Only time will tell if our hard drives will share the same fate as other storage devices like the punch card and tape reel.